It’s an understatement to say that we really love tea. We drink more tea in our household than all other beverages combined. Green tea, hibiscus tea, and fennel tea are some of our regulars, but this post is about 3 new (to me) teas that I’ve started incorporating into my daily routine over the last few weeks. We’re partnering with Traditional Medicinals on this post because their teas are so wonderful. This slightly bitter tea reminds me of some of the teas that we enjoyed with breakfast in Japan. 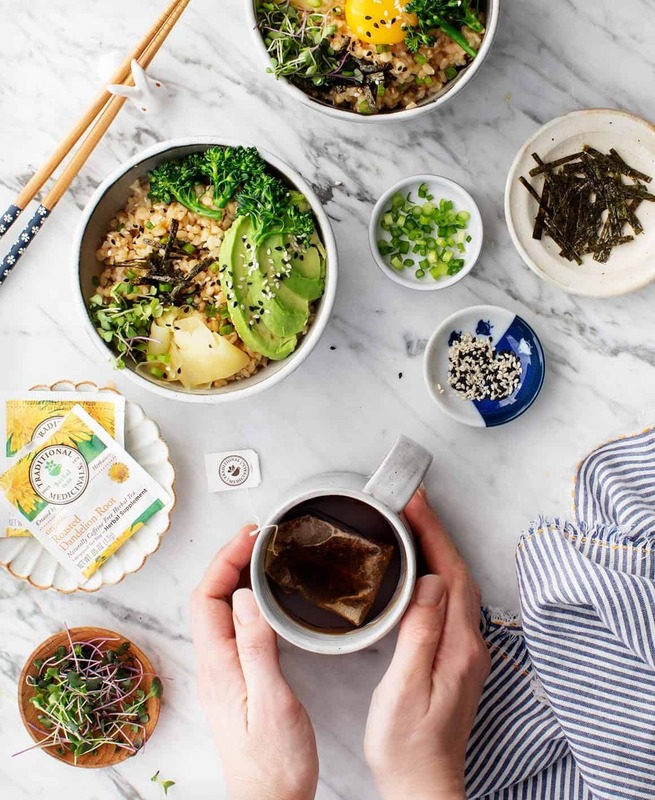 The deep roasty flavor inspired me to start making brown rice breakfast nori bowls – the whole grains, vegetables, and earthy tea make me feel like I’m getting my day off to a healthy start. Tasting Notes: Earthy, with pleasantly roasted bitter notes. 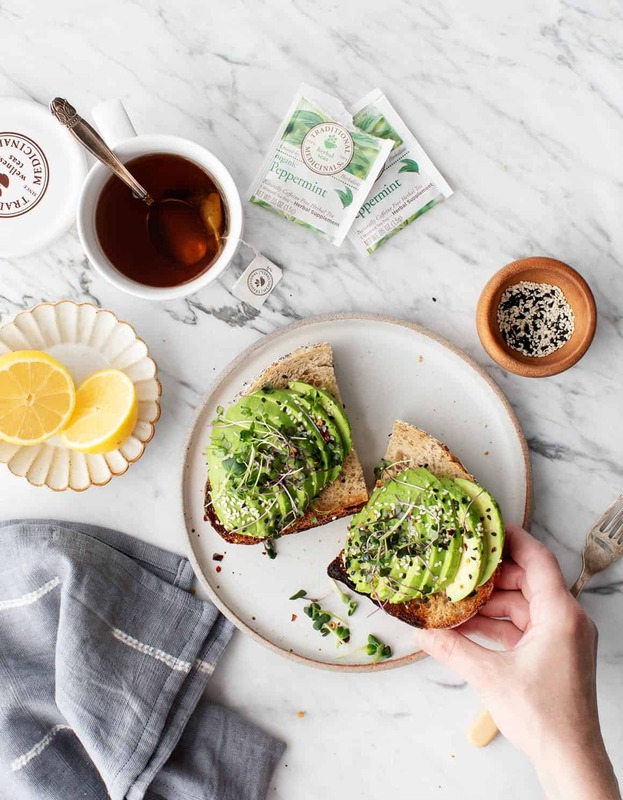 I work from home, so I usually put together a pretty simple lunch like avocado toast with lots of lemon, sea salt, and sprouts. These bright flavors pair well with this bright-tasting tea, especially during these not-so-bright winter days. Tasting Notes: Aromatic and undeniably minty. Tasting Notes: Warming, earthy and savory with a hint of spice. If you try out your own 3 Teas, 3 Weeks routine, I want to know what teas you love! To get started, Traditional Medicinals is offering a buy two teas, get one free deal (click here) so that you can choose your own 3-tea combo. I usually find my teas at Whole Foods or Target. Special thanks to Traditional Medicinals for partnering on this post. I love tea too! It really helps when I can’t decide if I’m hungry or not. I always have a cup of tea first and if I’m still hungry, then I have a small snack with more tea. My favorites are also Traditional Medicinals—their Moringa with Spearmint and Sage and their Mountain tea. I love mint teas the most. I find them light (because I am not a fan of black tea) yet quite satisfying. I also love Harney & Sons Mint Verbana. It has such a robust mint flavor. No matter how hard I’ve tried, I’ve never been a tea person, until I had my baby and trouble producing enough milk. Traditional Medicinals’ Mother’s Milk tea was recommended 3-5 times per day. First, it worked! Second, I actually love the flavor, which is a bit licorice-y, and many report having trouble getting down. After 10 months of a regular tea habit, I wonder what will become of me when I stop nursing…I can’t imagine life without the rhythm of tea. Traditional Medicinals teas are the best! It took me years to understand the difference between “drinking tea” and the benefits of actual “medicinal” herbs. Now in the winter Echinacea Plus and Throat Coat are always nearby. And our nightly tea is Belly Comfort. I absolutely love Echinacea Plus, Breathe Easy is also one of my favorites! Try Rose tea from Tulsi. It may sound too floral but it is really delicious! There’s a promo code on the website link, 3TEAS3WEEKS, where you get one free box of tea when you buy two. There’s not a coupon, but if you enter the code 3TEAS3WEEKS at the checkout on their website to get the discount. Thanks for sharing! I’ve rediscovered barley tea lately (can’t seem to find it in stores but can find it online). Basically, same benefits as eating barley but in tea form. The taste is hard to describe (like drinking … toast?) but I love it! Pleas share how to for the breakfast nori bowls! An avid tea drinker so always enjoy hearing stories and interest to what teas dazzle one’s tastebuds. Lately pureh, matcha or my own tisane blends fill my tea cups though always open to try something new; thanks for the recommendations. Too, I am so appreciative of all that is shared from Love and Lemons – lots of good information and delicious recipes. Thanks. I loved getting some insight into your tea routine! My fiancé and I are similarly obsessed and we have over 20 tea varieties in our house. I always love to drink the Trader Joe’s ginger and turmeric tea with meals to aid in digestion! I love ginger tea, rich and spicy with lemon and manuka honey. I also love sage and lavender tea, very soothing before bedtime. I also consume vast amounts of tea. It’s pretty much the only beverage I consume, though I recently have started drinking hot water with a piece of lemon in it. But my go-to tea is English, Irish, or Scottish breakfast tea; I love tea with milk in it, and these teas work well with milk. Assam is also good with milk! I also have discovered that a cuppa is a great way to stave off hunger. I make a small cup when I get home from work, and it keeps me from snacking before dinner.